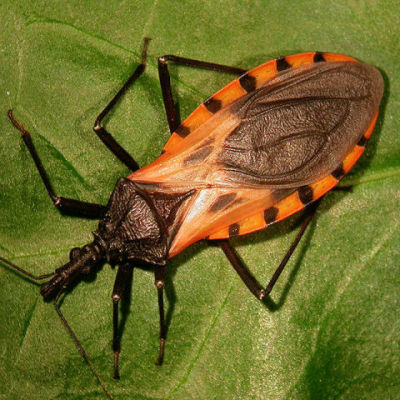 Kissing bugs can carry and transmit the potentially fatal Chagas disease in their feces. Chagas is a parasitic disease that affects the heart and the nervous system. Thousands of deaths in Central and South American are attributed to the disease. The disease is still rare in the U.S., and, for some unknown reason, while the bugs are on the increase in the U.S., so far the disease is not following suit. You are more likely to contract the disease from someone who has visited South American than from the bugs. The parasite can also be transmitted through blood transfusions, organ donation, ingestion of contaminated food, from mother to fetus, or through breast milk. Blood and tissue donor organizations in the U.S. already screen for Chagas. The insects like to feed on naked skin. It is when the feces get rubbed into an open wound or mucous membranes, such as the eyes, that the disease is passed along. They tend to go for the face, especially at night while you sleep (some say that this is where the name kissing bug really came from). However, it is pets that may be at the greatest risk since the little buggers prefer animals. Even for them, the chance of infection is fairly low. Prevention includes the use of insecticides and good sanitary conditions. Dog Walking: How Long Should Your Pet's Walk Be?